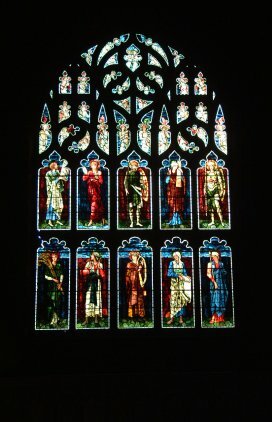 The two large stained glass windows showing 10 people from the New Testament and 10 people from the Old Testament were original designs by Burne-Jones. All the Transept and Clerestory windows were donated by Abel Buckley. The great leader of the Jewish people, the law giver and founder of their institutional religion, and brother of Aaron. Exodus tells how Moses led the Jews out of Egyptian captivity and how he received the Ten Commandments from God. Here he is shown with the TABLETS (the ten Commandments). Miriam was the sister of Moses and Aaron (Numbers 12:1-15.) There are no references to attributes for Miriam. Here she appears to be holding a mirror, the attribute of Prudence (see East Window). The first of the great Hebrew patriarchs of the Old Testament. Called by God, he left Ur of the Chaldees with his wife Sarah and nephew Lot to go to Canaan. Abraham is usually attributed with a knife when intending to sacrifice Isaac, his son. However, here he is depicted covering the story in Genesis 14: 18-24. After their sojourn in Egypt to escape the famine Abraham and Lot came north again rich in cattle’. They separated, Abraham returning to Canaan, Lot settling in Sodom. When raiders attacked the Cities of the Plain, Lot was captured and his possessions seized. The news was brought to Abraham who armed some three hundred men and set off in pursuit. He attacked by night and defeated the foe. The window depicts Abraham wearing armour carrying his lance and shield. A prophetess and judge of Israel who fought the Canaanites (Judges 4:5). She was also Rebecca’s nurse (Genesis 35:8). There are no attributes for Deborah. She was spoken to by God and she is shown here listening to something which may signify her listening to God’s word. Moses’ successor, the war-leader of the Israelites who captured Jericho and subsequently conquered Canaan, the Promised Land. Joshua, whose name is a variant of Jesus, was regarded as one of the many Old Testament prefigurations of Christ, the fall of Jericho foreshadowing the Last Judgement. Joshua is depicted in armour with spear and shield. A Moabite woman and great-grandmother of David, and therefore, by the traditional reckoning, an ancestress of Christ, hence her place in Christian art. She was married to a Hebrew immigrant in Moab and after his death left her native land and went with her mother-in-law Naomi, to Bethlehem. Here she was allowed to glean the corn in the fields belonging to Boaz, a rich farmer and kinsman of Naomi. Boaz, seeing her and admiring her virtue assumed the responsibilities towards her of a kinsman, and in due course he married her. Ruth is shown here with a sheaf of corn. Prophet and last Judge of the Israelites. In the first book of Samuel Chapter 3 we read of Samuel being awoken from his sleep three times when he hears his name called. Three times he went to his father Eli thinking he had called him. Eli realized that it was the Lord who was calling Samuel so he told him “Go back to bed; and if he calls you again, say, Speak Lord, your servant is listening”. The picture here of Samuel shows him with his hand to his ear, listening. The shepherd boy who became king of Israel. Much legend appears to surround the biblical account of this complex and many-sided personality. He was a bandit chief, a warrior and a statesman; he made Israel a united kingdom and captured Jerusalem, making it his capital; he was a musician and was traditionally believed to be the author of the Psalms. He is depicted here in shepherd attire playing the harp and appears to have a crown upon his head. One of the four ‘greater prophets’. (The others are Jeremiah, Ezekiel and Daniel). He owes his place in Christian art chiefly to two famous prophecies – “A young woman is with child and she will bear a son”, which may appear as his inscription on a scroll, is the source of Isaiah’s association in art with the theme of the Annunciation. The other prophecy is - “A shoot shall grow from the stock of Jesse”. His normal attribute is a book or SCROLL. The Old Testament book of Esther describes how a young Jewess interceded with a Persian king to prevent the massacre of her people. For this deed she is still commemorated in the Jewish festival of Purim. King Ahasuerus of Persia, who reigned in the 5th cent. B.C. having dismissed his queen because she had offended him chose Esther to replace her, not knowing that she was Jewish. Esther had been brought up by her cousin, Mordecai. The king’s chief minister, Haman, an enemy of the Jews and the personal foe of Mordecai, decreed that all the Jews in the Persian empire should be massacred. Mordecai asked Esther to intercede with the king. To enter the king’s presence without being summoned was forbidden on pain of death, even to the queen, but Esther, having dressed in her finest robes, took her courage in both hands and entered the royal chamber. Ahasuerus held out his golden sceptre to signify that he would receive her. Her intercession on behalf of her people succeeded. Esther is shown here with sceptre and probably a crown and perhaps shown dressed in her finest clothes. God created Adam (and Eve) together with the plants and animals, on the sixth day. Here Adam is shown with his spade to represent the Garden of Eden. He was a descendant of Adam. He had a son, Methuselah. “After that, Enoch lived in fellowship with God for 300 years and had other children. He lived to be 365 years old. He spent his life in fellowship with God, and then he disappeared because God took him away” (Gen.5: 22-24). Luke 3, v.37 says Enoch was the son of Jared which he lists in the Ancestors of Jesus. Enoch is depicted here holding an open book. It may be that the book represents Enoch opening and beginning the book i.e.. Enoch the beginning of what was to come. One of the four ‘greater prophets’. (The others are Ezekiel, Isaiah and Jeremiah). The book of Daniel describes how Daniel rose to a position of influence in the Babylonian court, because, like another Jewish exile, Joseph in Egypt, of his skill in interpreting dreams. He is also a personification of Justice. Daniel is shown in the artwork carrying a book and holding something in his hand – it appears to be another hand – the hand of God? The hand appears to be coming out of a cloud. (Also referred to as Enosh). Seth had a son whom he named Enosh. It was then that people began using the Lord’s holy name in worship (Jgen.4:26). Luke lists the ancestors of Jesus and quotes Enosh as the son of Seth. Enos is shown here in an attitude of worship. Elijah (c. 9th cent. B.C.) Hebrew prophet, a forceful character who vigorously opposed the cult of Baal among the Israelites. During a prolonged drought Elijah went to dwell by the brook Cherith which still ran. Ravens brought him bread and meat morning and evening. Elijah is shown here with a ravens feather held in his hand. According to legend he lived as a hermit on Mount Carmel and was traditionally regarded by the Carmelites as the founder of their Order. He is usually dressed in the Carmelite habit, a white mantle over a dark brown tunic. Here he is shown in the brown tunic. Jeremiah taught that the spiritual salvation of the Hebrews would come about only through oppression and suffering, a view that led to his persecution and eventual retirement to Egypt where it is said he died by stoning. He is shown old and bearded and perhaps deep in thought (as in Michelangelo’s depiction of him in the Sistine chapel). His normal attribute is a book or SCROLL. Here he may be shown with the scroll rolled up and laid across his arm.